Once upon a time, there was a 3 year old little boy called J. He lived in a little cottage at the edge of the woods with his Mum V and his Dad M. The family C loved to spend time together doing fun things and were always seeking out adventure. One fine summer afternoon, they were out walking in the woods when out popped a tall man wearing a purple cloak studded with silver stars and a green pointy hat. "Good morning!" said the man. "I am the Robinsons Fruit Shoot wizard. And I am here to challenge you to get your skills on. Your quest is to complete a series of at least 10 tasks and have lots of fun along the way. Get creative, get adventurous and do your very best. Your efforts shall be rewarded." The family were always up for new challenges. They accepted the Robinsons wizard's dare. Just to make things a little bit more interesting, they decided to take on a dozen instead of just the stipulated 10 Get Your Skills On challenges. Little J decided he would be the one to take on the first challenge. 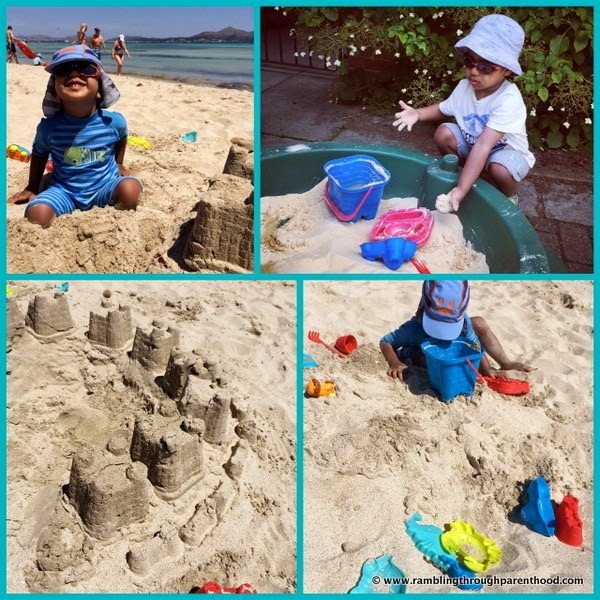 So while the family was holidaying by the sea-side, he took to building castles in the sand. Not happy with just one, he built a series of them complete with moat et al. And then when they returned home, he carried on practising his newly acquired sandcastle building skills in the sandpit in the back garden. The back garden of the C-household was to be the setting for quite a few of little J's triumphs. One sunny day, he said, "Mum, I want my basketball hoop to go high up." Mum was sceptical; the hoop was at 6 feet already. But she did not want to discourage her brave little boy. So up went the hoop, hoisted another foot in the air. And within no time, J had proved that his confidence was not misplaced. He netted a neat basket. And Mum was lucky to capture the moment on camera for posterity. J is very fond of mini-beasts. He and Mum often spend time in the garden looking for spiders, ladybirds and snails. Little wonder then that J chose to walk around the garden like a spider for the next challenge. Not easy work at all, scampering around on your hands and feet and making it look so adorable at the same time! Little J was doing his bit for the family's skill-building challenges. It was now time for Mum and Dad to take on the mantle and hone their skills. Mum decided to do two of the time-trials. After a few wobbly attempts, she dribbled a shiny lit-up ball for 15 seconds. And then she walked a full 15 seconds wearing a zebra mask and balancing a box of crayons on her head. Looking quite amusing in the process. Dad opted to brush up his frisbee skills, and managed a lovely throw straight into the hands of a waiting friend. There were others that went slightly amiss, but we shall not dwell on those. It was back to little J for the remaining tasks. Always with lots of support and encouragement from his doting parents. The Robinsons Fruit Shoot wizard did want them to work as a team. And they loved doing things together as a family anyway. So off to the park they all traipsed where J sat on the 'big boy' swing instead of his usual 'baby' one. Up and up he went, high up in the air. Mum was anxious, but Dad was cool as a cucumber. J was brilliant as he held on tight and did not try to jump off in mid-air. Phew! Mum breathed a sigh of relief. As if that wasn't enough excitement for one day, J had a go at climbing a tree for the very first time that day. A bit of a leg up from Dad, and he had clambered up into the branches. This can only be the first of what are sure to be many more escapades from J.
J managed another remarkable first with these tasks. After a bit of coaxing from Mum, he rolled down a grassy hill. And then again and again till he was out of breath and could roll no more. On the day the family C had taken a picnic to a lovely deer park. There was a little play area in the park with built-up dens. J had a pretend-play session in one of them. And then wanted to make one of his own when he got home. 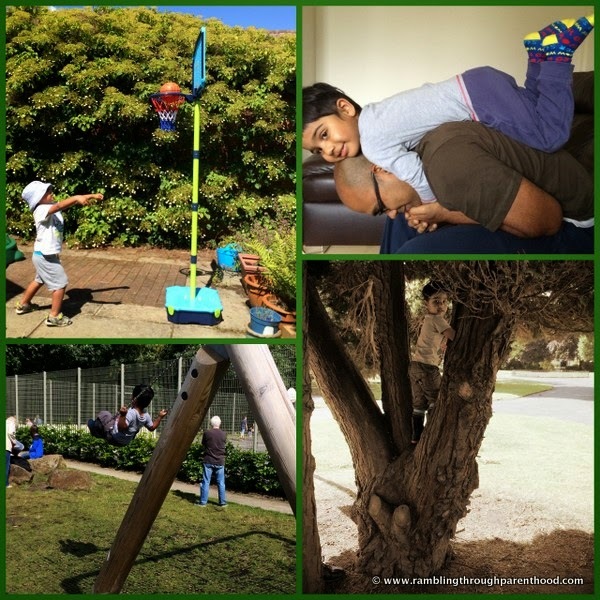 Now the garden at home did not have lots of sticks and branches to build a den. So Mum improvised. Out came the dining room chairs and out came a lovely blue bed-sheet. One draped over the other, and J had a delightful den. Then it was time to do what J does best. Make some music. The boy is a natural when it comes to picking up a beat. Even something as simple as a saucepan and whisk can sound musical in the child's hands. For the last Get Your Skills On challenge, the family C decided to do what they all love. A good old session of rough and tumble. So J had a go at climbing all over Dad, while Mum clicked away furiously with her camera. J did hop onto Dad's back for a little piggy-back ride at some point during all the rough-housing. And that was that. The family C had completed their series of the Robinsons Fruit Shoot tasks. But this is not the end of their story. All stipulated challenges successfully completed, the family C has decided not to rest on their laurels but carry on working their way through the entire list of 40. So there will always be something interesting to do, some new skill to learn and some fun to be had along the way. Disclaimer: This is my entry to the Robinsons Fruit Shoot #GetYourSkillsOn challenge. The bit about the Robinsons Wizard is fiction. Everything else is absolute fact and it is indeed the members of the C-household that were involved in participating in and competing the Get Your Skills On challenge. Sounds like you had lots of fun. And well done, J. I love the way he kept finding new challenges - sounds like a very cool little boy. Looks like you all had an amazing time. 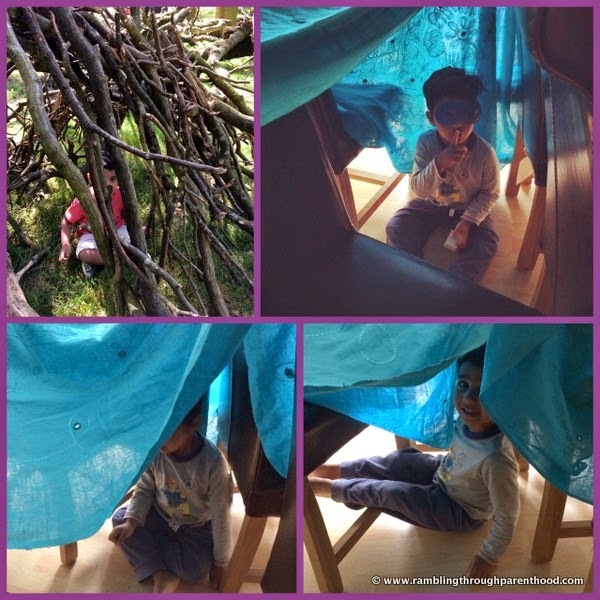 We love den making too, its just the perfect way to spend the day! Well done J!! It sounds like it's been lots of fun! Sounds like you have all had a lovely summer together. It's so nice to do things all together as a family.